The Dell™ OptiPlex 5260 All-in-One Basic Stand provides basic tilt functionality in the workplace for users of OptiPlex 5260 All-in-One systems. 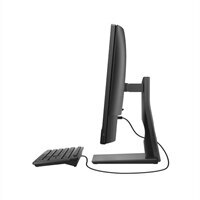 Dell OptiPlex 5260 All-in-One Basic StandThe Dell™ OptiPlex 5260 All-in-One Basic Stand provides basic tilt functionality in the workplace for users of OptiPlex 5260 All-in-One systems. Boost comfort and productivity Built for OptiPlex 5260 All-in-One systems, the Basic Stand allows you to tilt from +30 degrees backward to -5 degrees forward so you can feel more at ease in your workspace.